1958: Oscar a o Millor Actor por Separate Tables. 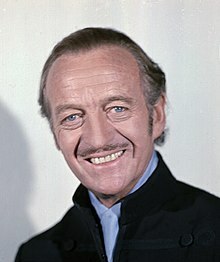 James David Graham Niven, d'o suyo nombre artistico David Niven, estió un actor britanico, naixito l'1 de marzo de 1910 en Londres (Anglaterra) y muerto o 29 de chulio de 1983 en Château-d'Oex (Cantón de Vaud, Suiza). David Niven recibió o Premio Oscar a o Millor Actor en 1958 por o suyo papel en a cinta Separate Tables, dirichita por Delbert Mann. Tamién recibió por ista cinta o Globo d'Oro a o Millor Actor Dramatico y o Premio NYFCC a o Millor Actor. En 1954 recibió o Globo d'Oro a o Millor Actor de Musical u Comedia por o suyo papel en a cinta The Moon Is Blue, d'Otto Preminger. 1932: There Goes the Bride, d'Albert de Courville, con Owen Nares, Jessie Matthews y Carol Goodner (no acreditato). 1933: Eyes of Fate, d'Ivar Campbell, con Allan Jeayes, Valerie Hobson y Terence de Marney (no acreditato). 1934: Cleopatra, de Cecil B. DeMille, con Claudette Colbert, Warren William y Henry Wilcoxon (no acreditato). 1935: Without Regret, de Harold Young, con Elissa Landi, Paul Cavanagh y Frances Drake. 1935: Barbary Coast, de Howard Hawks, con Miriam Hopkins, Edward G. Robinson, Joel McCrea, Walter Brennan, Frank Craven y Brian Donlevy (no acreditato). 1935: A Feather in Her Hat, d'Alfred Santell, con Pauline Lord, Basil Rathbone, Louis Hayward y Billie Burke. 1935: Splendor, d'Elliott Nugent, con Miriam Hopkins, Joel McCrea, Paul Cavanagh, Helen Westley y Billie Burke. 1935: Mutiny On the Bounty, de Frank Lloyd, con Charles Laughton, Clark Gable, Franchot Tone, Herbert Mundin y Eddie Quillan (no acreditato). 1936: Rose-Marie, de W.S. Van Dyke, con Jeanette MacDonald, Nelson Eddy, Reginald Owen, Allan Jones y James Stewart. 1936: Palm Springs, d'Aubrey Scotto, con Frances Langford, Guy Standing, Ernest Cossart y Smith Ballew. 1936: Dodsworth, de William Wyler, con Walter Huston, Ruth Chatterton, Paul Lukas y Mary Astor. 1936: Screen Snapshots Series 16, No. 4. 1936: Thank You, Jeeves!, d'Arthur Greville Collins, con Arthur Treacher, Virginia Field, Lester Matthews y Colin Tapley. 1936: The Charge of the Light Brigade, de Michael Curtiz, con Errol Flynn, Olivia de Havilland, Patric Knowles, Henry Stephenson, Nigel Bruce y Donald Crisp. 1936: Beloved Enemy, de H.C. Potter, con Merle Oberon, Brian Aherne, Karen Morley y Henry Stephenson. 1937: We Have Our Moments, d'Alfred L. Werker, con Sally Eilers, James Dunn, Mischa Auer y Thurston Hall. 1937: The Prisoner of Zenda, de John Cromwell, con Ronald Colman, Madeleine Carroll, C. Aubrey Smith, Raymond Massey, Mary Astor y Douglas Fairbanks Jr..
1937: Dinner at the Ritz, de Harold D. Schuster, con Annabella, Paul Lukas, Romney Brent y Francis L. Sullivan. 1938: Bluebeard's Eighth Wife, d'Ernst Lubitsch, con Claudette Colbert, Gary Cooper, Edward Everett Horton y Elizabeth Patterson. 1938: Four Men and a Prayer, de John Ford, con Loretta Young, Richard Greene, George Sanders y C. Aubrey Smith. 1938: Three Blind Mice, de William A. Seiter, con Loretta Young, Joel McCrea y Stuart Erwin. 1938: The Dawn Patrol, d'Edmund Goulding, con Errol Flynn, Basil Rathbone, Donald Crisp y Melville Cooper. 1939: Wuthering Heights, de William Wyler, con Merle Oberon, Laurence Olivier, Flora Robson, Donald Crisp y Geraldine Fitzgerald. 1939: Bachelor Mother, de Garson Kanin, con Ginger Rogers, Charles Coburn y Frank Albertson. 1939: The Real Glory, de Henry Hathaway, con Gary Cooper, Andrea Leeds, Reginald Owen y Broderick Crawford. 1939: Eternally Yours, de Tay Garnett, con Loretta Young, Hugh Herbert y Billie Burke. 1939: Raffles, de Sam Wood, con Olivia de Havilland, May Whitty y Dudley Digges. 1942: The First of the Few, de Leslie Howard, con Leslie Howard, Rosamund John y Roland Culver. 1944: The Way Ahead, de Carol Reed, con Stanley Holloway, James Donald y John Laurie. 1946: A Matter of Life and Death, de Michael Powell y Emeric Pressburger, con Kim Hunter, Robert Coote, Kathleen Byron y Richard Attenborough. 1946: Magnificent Doll, de Frank Borzage, con Ginger Rogers, Burgess Meredith, Peggy Wood y Stephen McNally. 1947: The Perfect Marriage, de Lewis Allen, con Loretta Young, Eddie Albert y Charles Ruggles. 1949: A Kiss in the Dark. 1950: The Toast of New Orleans. 1952: The Lady Says No. 1953: The Moon Is Blue. 1956: The Birds and the Bees. 1956: Around the World in 80 Days. 1957: Oh, Men! Oh, Women!. 1958: Screen Snapshots: Glamorous Hollywood. 1960: Please Don't Eat the Daisies. 1962: The Best of Enemies. 1962: The Road to Hong Kong. 1963: 55 Days at Peking. 1965: Where the Spies Are. 1966: Eye of the Devil. 1967: All Eyes on Sharon Tate. 1968: Prudence and the Pill. 1976: No Deposit, No Return. 1978: Death on the Nile. 1979: A Nightingale Sang in Berkeley Square. 1982: Better Late Than Never. 1982: Trail of the Pink Panther. Se veigan as imáchens de Commons sobre David Niven. (en) David Niven en IMDb. Zaguera edición d'ista pachina o 31 may 2014 a las 15:39.